Political values that are dear to the party will determine who the Liberal Party of the Philippines (LP) will support in the May 2004 presidential elections. While the LP has no presidential candidate of its own, its president, Congressman Florencio “Butch” B. Abad expressed his preference as a choice between President Gloria Macapagal-Arroyo and former Senator Raul Roco. “Looking at our (ideological) biases, it is going to be a difficult choice between GMA and Roco”, Abad told some 120 listeners, among them many senior party members, in a speech on “Liberal Strategies for 2004” organized by the Friedrich-Naumann-Foundation and the FNF-Alumni Group on July 16th, 2003 in Makati City. The LP-president gave an optimistic outlook of his party in the general elections. “There is a good chance that we can increase our numbers in the House (of Representatives) to 40 members”. The Congressman from Batanes said that LP could add two new liberal Senators in the Upper House and also increase its power on the local government level considerably. Cong. 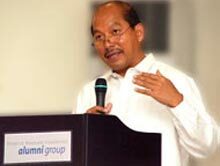 Abad reiterated the need to change the constitution. “Our party supports constitutional amendment through a constitutional convention”, Abad said. He also stressed the importance of building a “broad coalition” for political reform with civil society and the reform oriented business sector. He said that the political system of the Philippines is not conducive to the development of strong, platform-based political parties. “We operate in an environment that is hostile to institutional party building”, he explained. All the more important, therefore, are the efforts to strengthen the party institutionally and organisationally. “Let us make our party strong”, Abad emphasized. The text of Congressman Abad’s speech is posted in our Liberal Library. You may listen to what LP president Abad said about the party's presidential preferences by clicking here.